Hundreds of CubeSats have launched into Earth orbit over the last 15 years, but the Mars mission marks the first time the popular platform will fly into deep space. The twin CubeSat mission, known as Mars Cube One, will launch on an Atlas 5 rocket in March 2016 with NASA’s InSight lander. 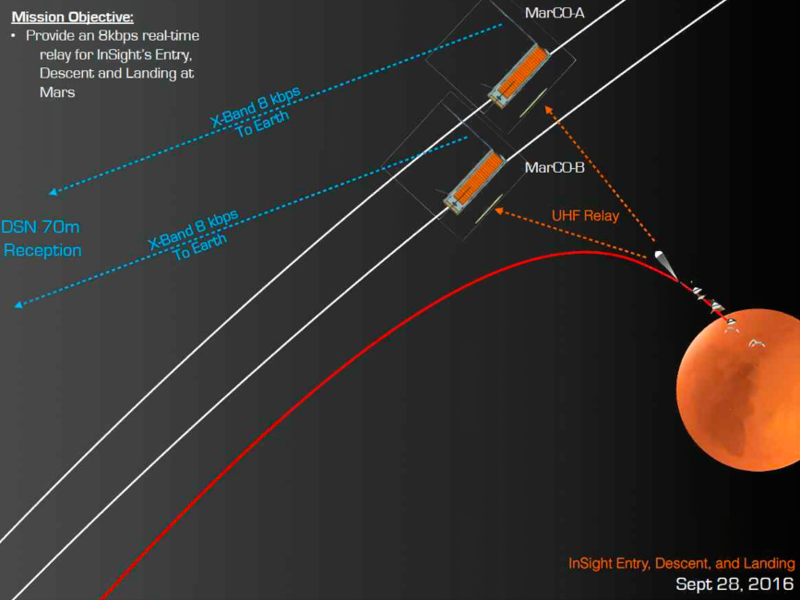 The CubeSats will relay status signals from InSight as the landing probe descends through the atmosphere, eliminating potential delays in verifying the success of the mission. NASA officials in May approved the launch of the CubeSats with InSight after confirming the $13 million secondary mission added no additional risk to the lander, according to a NASA spokesperson. 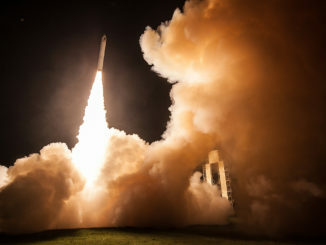 Each Mars Cube One, or MarCO, CubeSat spacecraft measures 14.4 inches (36.6 centimeters) by 9.5 inches (24.3 centimeters) by 4.6 inches (11.8 centimeters) when closed up for launch, according to the Jet Propulsion Laboratory, which announced details of the mission Friday. The miniature relay stations are based on a six-unit version of the CubeSat, which has a basic cubic form factor. Satellite builders add extra units when they need more power or extra space for experiments. JPL is building the CubeSats and manages the InSight mission, which carries a suite of French and German instruments to detect seismic activity and study the red planet’s interior. The MarCO spacecraft will launch inside a container affixed to the aft bulkhead of the Atlas 5 rocket’s Centaur upper stage, away from the payload fairing enclosure housing InSight during liftoff. They will spring-deploy from the Centaur stage after it releases the InSight spacecraft following launch from Vandenberg Air Force Base, California, Krajewski said June 9. 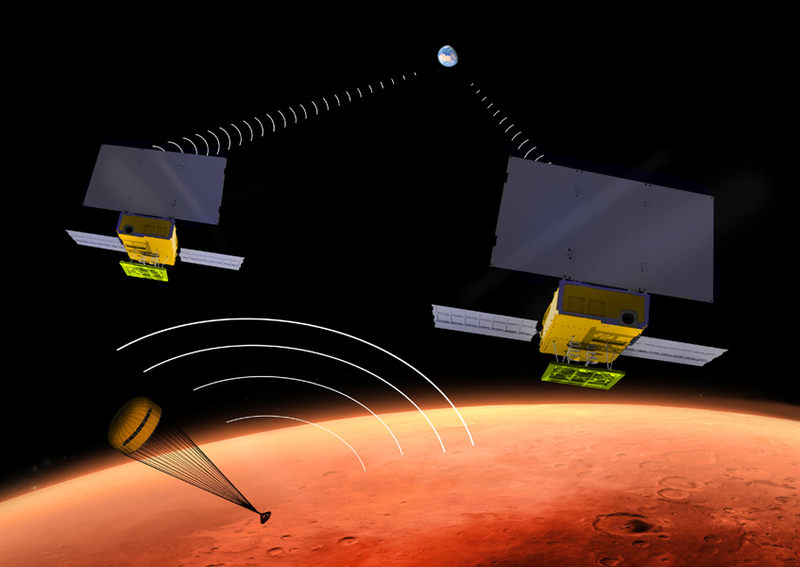 The CubeSats carry their own thrusters to fine-tune MarCO’s course toward Mars. The mini-rockets use pressurized cold gas similar to the refrigerant used in many fire extinguishers, Krajewski said. Eight of the thrusters will adjust the spacecraft’s trajectory, and four smaller jets will control MarCO’s orientation with a trio of reaction wheels mounted inside the main body of each CubeSat. The spacecraft will extend two solar panels to generate electricity, and a UHF receiver antenna and X-band high-gain reflector panel will open to link up with InSight and ground stations on Earth, according to Krajewski. MarCO’s primary duties occur as InSight plunges into the Martian atmosphere cocooned inside a heat shield, deploys a braking parachute, then fires landing rockets for touchdown at on a flat plain near the red planet’s equator named Elysium Planitia. InSight’s landing is scheduled for Sept. 28, 2016, after a six-and-a-half month cruise from Earth. 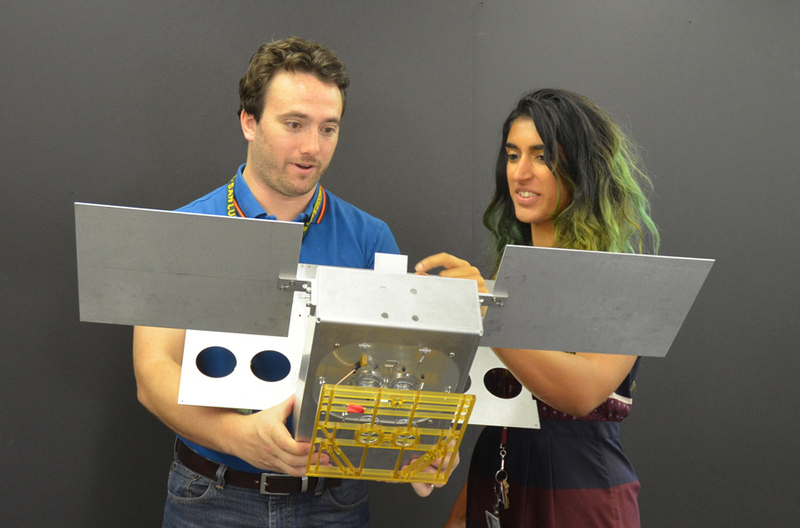 The MarCO CubeSats will not enter orbit around Mars. Their paths will take the probes past the red planet into solar orbit. The briefcase-sized spacecraft host communications gear designed to simultaneously receive status updates from InSight during entry and relay the information to Earth. The softball-sized radio on each CubeSat can quickly convert the signals between different radio bands, a capability not available on NASA’s orbiters around Mars, according to JPL. NASA’s Mars Reconnaissance Orbiter will be in range of InSight during landing, but the orbiter must listen for signals from the lander before converting the data to X-band to be sent back to Earth approximately 100 million miles away. Engineers do not need MarCO for a successful landing, but the CubeSats could save ground controllers from a nail-biting wait to confirm InSight’s status. Without MarCO, NASA officials said they could have to wait an hour before MRO can relay InSight’s descent data to Earth. 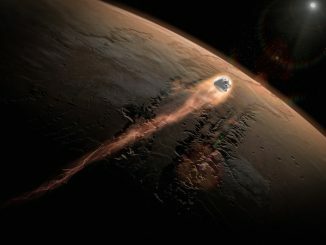 “Ultimately, if the MarCO demonstration mission succeeds, it could allow for a ‘bring-your-own’ communications relay option for use by future Mars missions in the critical few minutes between Martian atmospheric entry and touchdown,” JPL said in a press release. InSight is the 12th mission in NASA’s series of Discovery planetary science projects, which the agency selects from proposals submitted by scientists. 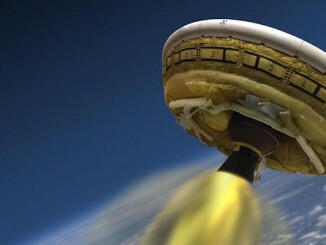 InSight’s 27-day launch window opens March 4, 2016.